Samsung's newest addition to the Note series uses an 8-inch display. But don’t worry, it still comes with the same special S Pen stylus and apps that gave the original its name. The device was announced just ahead of the start of Mobile World Congress 2013 in Barcelona on 24 February by the South Korean handset maker. So Samsung now has a true answer to the iPad mini: the Galaxy Note 8.0. It's about the same size as the mini, but Samsung adds the trademark twist of its Note line: a stylus called the S Pen. And it has a few new tricks. In order to fulfil your need of watching video on Samsung Galaxy Note 8.0, you can use Any Video Converter Free to convert videos for your Samsung Galaxy Note 8.0. You can also download YouTube videos to your computer with this free Samsung Galaxy Note 8.0 Video Converter and then transfer the downloaded YouTube videos to your Samsung Galaxy Note 8.0. Apart from Samsung Galaxy Note 8.0, you can also convert online video and home-made videos to phones and tablets like Nexus 7, iPhone 5, Samsung Note 2, Samsung Galaxy S III, Nokia, HTC, etc. 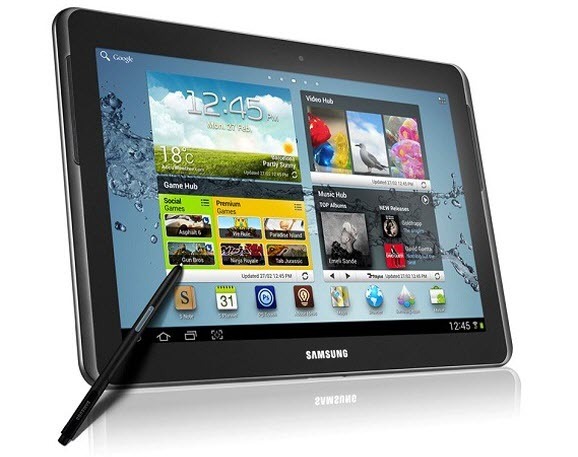 Download Samsung Galaxy Note 8.0 Video converter and enjoy all the great features of this supper portable gaming device! Samsung Galaxy Note 8.0 features a 1,280 x 800-pixel Super Clear LCD screen which provides user a better experience in watching movies or videos on this device. How to download and convert YouTube video to Samsung Galaxy Note 8.0? Samsung says it was designed to be like a personal notebook or diary and that it is the perfect size for you to take anywhere and watch videos, with WIFI and built-in YouTube player equipped, streaming online YouTube videos may ranks as your first option since YouTube holds the most of worldwide video clips, films, episodes for sharing. But viewing YouTube videos online with web connection may be troublesome when taking the unstable internet connectivity into account. Here this free Samsung Galaxy Note 8.0 YouTube Video Downloader and Converter is your best choice. Click Download button, paste YouTube URL to the pop-out box and start downloading. Note: You need to find out the YouTube video URL. Please click on share button under the YouTube video then copy URL on the tab. You can also right click on the video window and click "Copy Video URL" to get the URL. After the program has downloaded the YouTube videos, click "Preset Output" and choose your output device and output format. 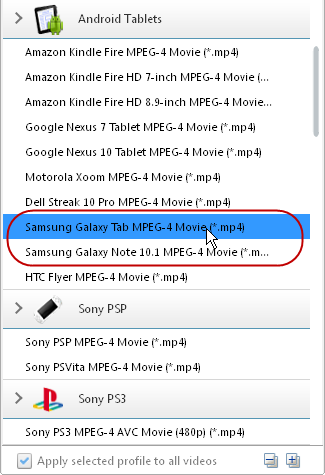 Please click the button on the upper right to activate the drop down menu, scroll to Android Tablets then choose "Samsung Galaxy Tab MPEG-4 Movie(*.mp4)". 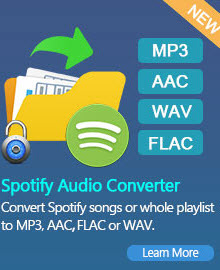 Click Convert button to start the conversion process. Once the conversion is completed, right click on the video thumbnail select "open destination file location", there will show you the converted video files. Then you can transfer the converted videos to your Samsung Galaxy Note 8.0. Apart from YouTube videos, you can also download video from facebook, nicovideo, myvideo, vevo, veoh, dailymotion, break and more online streaming video. Read More: How to Watch iTunes Movies on Samsung Galaxy Note 8.0? Apple encodes iTunes movies and TV shows with DRM protection. If you transfer the movies you downloaded from iTunes store to your Samsung Galaxy Note 8.0 directly, you will find that the iTunes video file cannot read properly on it. 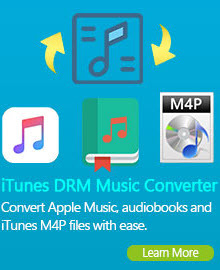 With M4V Converter Plus, you can remove DRM protection from iTunes movies and TV shows and convert them to unprotected video files for playback on Samsung Galaxy Note 8.0 in simple three steps.